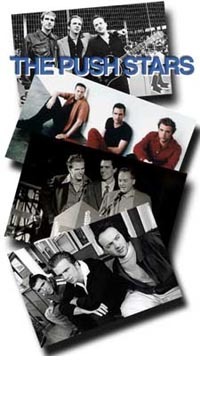 The Push Stars started out back in 1996 on Imago Records with their debut CD, Meet Me at the Fair, winning "Outstanding Debut CD". After winning the "Best Unsigned Band in America" in a competition in 1997, they released Tonight, moving on to be signed by Capitol Records and releasing After The Party. Now that they are severing their ties to Capitol Records voluntarily, they are releasing Opening Time on their own. They have been on several sound tracks and are spreading their infectious music to new listeners everyday. The Push Stars consists of an exceptional singer and guitar player who seems to put his heart into every song he sings, Chris Trapper, a sensational bassist and keyboarder, Dan McLoughlin, and a drummer who creates the inspiring beat, Ryan MacMillan. You can check out their biographies on their official site.